New Elektar Century amp info? Hello everyone, I just wanted to start off saying, I've had this amp for about a month now and I wouldn't trade it. I'm very happy with the tone and sound from it. At first I had the apprehensions from a few bad or semi-bad reviews, and the hum. But, number one I changed the pre-amp tubes for brand new Groove-tubes 12ax7-C tubes, and adjusted the power tube bias. The specs I finally found on a schem. for the thing. The range is listed from 15-25mv so I set the bias as close as I could for about 80% of that one tube ended up at 21.5mv, the other at 22mv that was as close as I could get them. At first they were close but about 3-4mv apart from each other. Too much, I thought so I figured I'd at least try getting them as closely matched to each other at least, but turned out much better and now the amp truly sounds really good for the price paid. This cut down the hum everyone talks about, to at least half so that it's now only realy noticeable when you're not playing. I went to GC to get the Epi. LP Traditional Pro. They didn't have anymore in black like I originaly wanted but,the more I looked at the last one they had at the time in Wine Red, the more beautiful it looked then I sat down with it and played it for only a few seconds before I fell in love with it. Then My eye caught this really cool retro lookin amp so I plugged the guitar I was playing and, planning on buying. All I can say is Wow it's like these two were made to be played together. But, I asked about the owners Manuals for/or paperwork that went with it, (the guitar, or the amp). 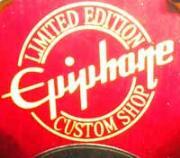 The salesman said that Epiphone now wanted you to download it online. Well I've yet to find anything like a useful manual anywhere on the internet. If anyone could help Me with a link or anything, or how to go about obtaining these Manuals or at least the proper bias procedure for the amp. Any help is appreciated. Thanks in advance. Thanks a lot man! I had already found that one but didn't think it looked like it was from this decade or so, LOL. After more closely looking at it after you posted the link I see it has been updated but just I suppose to look retro, I don't know? The link for the schem. didn't go to a page that had anything for the new Elektar Amps, everything else though. Oh well, I just expected to get some kind of paperwork with the thing. Either way I found a schem. and the bias range so that's what I mostly wanted. As for the guitar L.P. Trad. Pro, I love it. The more I play it the more I want to play it and I am happy with the amp, it can definitely get loud enough for a small gig but, I just like to play with a few friends from to time and it's my favorite way to pass time. I've come to love to play. I also love the retro look of that amp. the QC must have been hit and miss because I seem to have got a very nice one, that plays equally nice. Thanks Crust for the help,and thanks Epiphone for fine instruments, at reasonable prices.